Palm Springs Celebrates Its Past, And Tourists Arrive In Droves Palm Springs was the desert playground of golden-era Hollywood. Then its glamour faded. Now its midcentury architecture, its retro style and the allure of its past are fueling a rebirth. 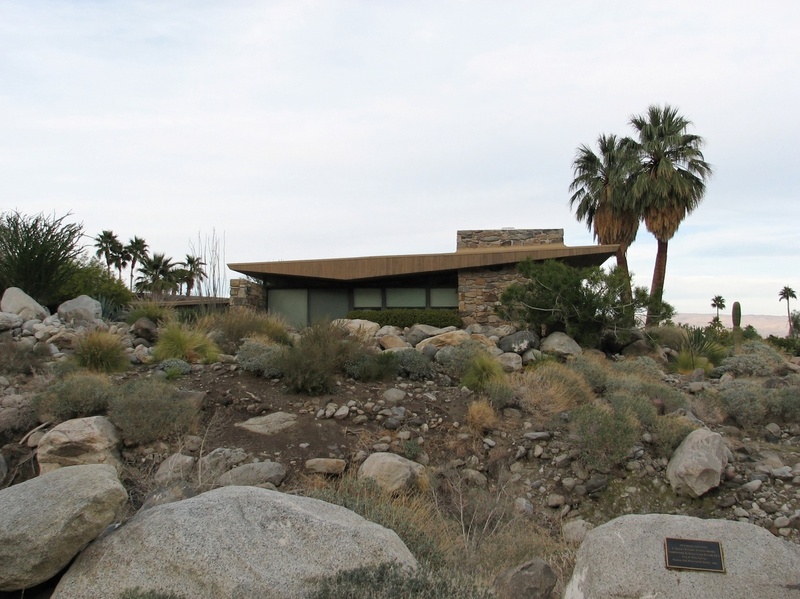 Now a stop on Palm Springs tours, this iconic desert house — shown here in a 1970 photo — was designed by modernist architect Richard Neutra for department store magnate Edgar J. Kaufmann in 1946. About 100 miles east of Los Angeles, Palm Springs, with its cloudless skies, bright sunshine and warm temperatures, was the desert playground of golden-era Hollywood. It attracted stars like Elizabeth Taylor, Frank Sinatra, Marilyn Monroe and Lucille Ball. As the years passed and the city's glamour waned, Palm Springs became better known for tanned retirees and sprawling golf courses. But these days, the city's past is making it a hip destination again. Palm Springs is the capital of midcentury modern. The style evokes America's post-World War II economic boom and the optimism that swept the country. Think clean lines, flat roofs — and lots of glass and concrete. Palm Springs houses like this represent classic midcentury modern style. Interest in the architecture, art and style of decades past is fueling Palm Springs' rising popularity among younger people. Tourists flock to the town for double-decker bus tours during Modernism Week, a February festival celebrating the city's midcentury architecture. But it's not just architecture that Palm Springs and its Modernism Week celebrates; it embraces all aspects of the Mad Men aesthetic. The cocktail parties and vintage fashion are drawing new enthusiasts. This year's festival brought in nearly 60,000 people and around $22 million. "You don't hear the mayor talk much about golf. I talk much more about having a good time and fun, like the Rat Pack used to," says Palm Springs Mayor Steve Pougnet. "We got through the recession, made a concerted effort to attract architectural enthusiasts; to attract millennials, gay and straight; market heavily in the areas of San Francisco and Los Angeles and San Diego. We were gonna celebrate our history, but we were going to move forward." The renaissance taking place in Palm Springs has been a long time coming. When Chris Menrad, a local real estate agent and preservationist, moved to the desert in the late 1990s, the city had a much different reputation. "Friends of mine just said, 'Oh, you're going out there where — isn't that just full of old people?' And I go, 'Well, yes, they're there.' But I get a sense there are younger people moving and I already saw it a little bit happening, so yes. The vibe has changed." The changing vibe has triggered new investment. The old Howard Johnson's motor lodge has been refurbished and transformed into the sleekly cool Ace Hotel. "The city has really hit a turning point where, you know, most of the old legacy properties have already been brought back to life," says Ezra Callahan, 34. He was the sixth hire at Facebook and is now investing in one of the first new hotels to go up in the city in decades. It's called Arrive. 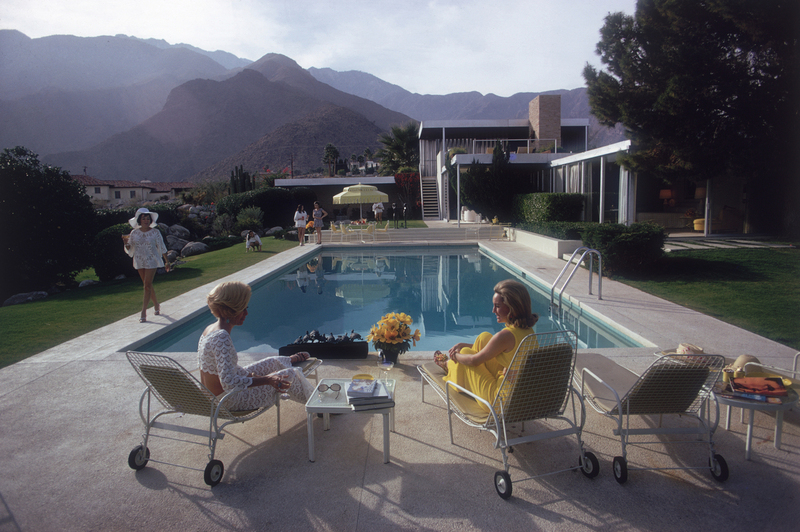 Instead of Austin, L.A. or New Orleans, Callahan chose Palm Springs because of the allure of the city's past. "I think Palm Springs, kind of having been this place that was where the cool kids went in the '50s and the '60s — it's where Hollywood came to play. You saw women in bikinis, and I think that appeals to millennials and a younger generation." "Palm Springs has remade itself as a kind of destination for the consumption of a type of style," says Robert Lang, an urban affairs professor at the University of Nevada, Las Vegas. "The closest parallel is the way art deco is used in Miami Beach." Lang says Palm Springs is "the only city that, so far, I can say fully understands ... the marketability and the value and the inherent nature of knowing yourself, knowing your architecture, knowing your history, and using that as the leverage point to a larger economic revival." While Palm Springs channels the cool of its past to introduce itself to a new generation, it still resonates with baby boomers. Jane Sack, a first-time visitor from the Northeast, has years left in her law career. But after spending a few days in town during Modernism Week, she's enthusiastic. "It's a beautiful place to live. The weather is incredible. The people care about their environment, and, um, I'd love to be able to retire here," she says, laughing. Frank Sinatra and Marilyn Monroe may no longer be escaping to the desert, but Palm Springs is again becoming a destination for the cool kids.